The Phoenix PH, Old Dover Road, Canterbury, Kent. Pub, Free house. 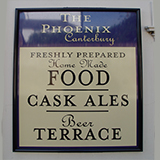 The Phoenix pub is situated on the corner of Old Dover Road and Cossington Road, between the County Cricket Ground and Canterbury city centre. 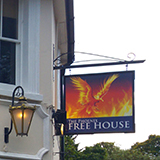 A Free House, The Phoenix always endevours to stock eight real ales, including one mild. Food is available lunchtimes and evenings, there is outdoor seating on our beer terrace, a covered smoking area and a patron's car park to the side. Every Wednesday is Quiz Night at The Phoenix, starts 8.30 pm (£1.50 entrance, 3 chances, no win means a rollover ‘til next week, snacks at half time). Bob & Nilla Griffiths are now the licensees, having also been running the Rose & Crown in St.Dunstans for over three years and now transferring their attentions to The Phoenix. While both now are retired, Bob was previously in medical sales whilst Nilla ran two hairdressing salons. Last owning pubs thirty-four years ago in Rochester, including The Don Cossack, they now turn their attentions and fondness of real ale to one of Canterbury's best known hostelries, well loved amongst cricket fans, visitors to the city and locals alike. Bob's family were in Pubs all his life and he learnt his cellar skills from his step father who apart from being a Licensee had also been a dray man for twenty-five years, and so there was nothing you could tell him about beer, (one quote being "there are no such thing as bad beers, just some better than others"). As a Free House, we are very keen to promote Real Ales and host beer festivals at least four times a year, including our Christmas ale themed festival, our Wicked Brew Beer and Music Fest featuring beers from Kent Breweries, the War of the Roses Beer Festival for the May Day Bank Holiday and our 'Canstock' music festival. Check the ''ales'' page for more. Check the ''ales'' page for more on our current selection and upcoming beer festivals. 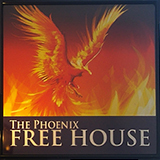 Live Music, every week at The Phoenix, from 8.30pm 'til late. More details on our ''live music'' page. For an example of some of the wide range of food available at The Phoenix both evenings and lunchtime, please see our ''food'' page. 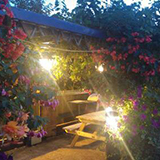 We have an outdoor seating on our beer terrace to the rear of the pub, a covered smoking area and a patron's car park to the side. Copyright © 2019 The Phoenix PH, Canterbury : all rights reserved.